Since my last issue of this newsletter, we've seen two winter visitors that haven't been here so far this year. 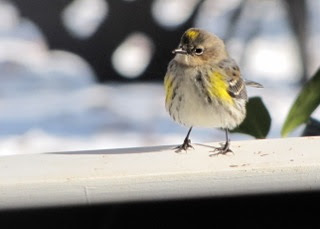 The Yellow-rumped Warbler has visited for many years at various times. It's a busy little bird. The male you see seems to have a perky personality. In case you're wondering about the yellow rump, here's another photo that shows you that bright yellow spot. In winter and migration, Yellow-rumped Warblers are found foraging in quite large flocks with their own species, but this one seems to be on its own. They don't nest in our Central Virginia location so it's a real treat to enjoy them as a winter visitor. Helps to put delight into the winter months too. Insects are their main diet during the breeding season, but you won't find many of those here in winter, although they do look to uncover them in wintering-over locations like our tree stumps and such. So they rely heavily on berries when insects are not available. Their small size and the ability to digest the wax on many berries is unique among the warblers. Our other holly berry loving birds are much larger species. 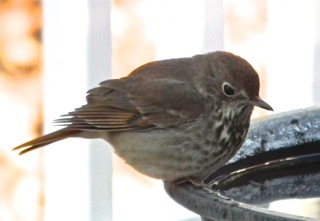 The Hermit Thrush has a lovely, melancholy song that resonates through the forest. It's melancholy and yet has a great peace about it. Totally unusual song. When you hear it you know it's a Thrush, although you may not recognize which species. We have the Wood Thrush here also and they seem to always sing from the back part of the woods. They like to be in understories of far northern woods in summer which is where they nest. camera wouldn't work and I didn't get photos. When I looked at last year's photos, I saw that we had that one on the same day as this year. 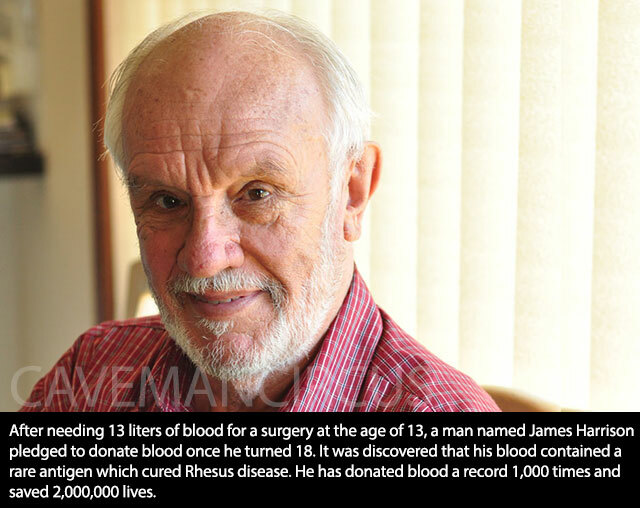 Isn't that amazing! It's a winter bird for us since they don't breed here. Tidbit - Fingernail Ridges - Over the past ten years I've noticed vertical lines running up and down on many of my fingernails. I remember a friend of mine that had the problem and the lines were turning black. I decided to search for some information about this and a natural solution using essential oils. It turns out that it's common in older people. As we age our nails become drier and the solution recommended was to mix up a blend of various natural oils (like almond, coconut, grapeseed, etc.) with beeswax to make a solid kind of salve to rub on them. Sounded a bit too complicated to me. I love simple solutions. At the time my husband had gone to the dentist and they had a bowl of Lip Moisturizers at the checkout area for patients, so he took one. I had checked what the ingredients were before placing it in my drawer, so I remembered that it had some natural oils in it and had to have beeswax to keep it solid .... so I got it out and turns out that I can just rub that on the nails and cuticles in hardly no time. My nails have improved greatly in the three weeks that I've been using it and I'm still continuing the "remedy." The most irritating thing about it is that those lines finally split and make a ragged edge at the end of the nail. I had two doing that and they were catching on everything. When they go all the way back into the nail bed, it becomes more of a problem since you can't file them smooth and it becomes a raw area. So glad I found a simple solution. I would think that Burt's Bees had something similar. 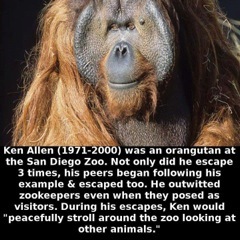 Critters - Orangutan - I can't imagine an animal in a zoo being "peaceful" but I guess many adapt better than others ... just like people do in hard situations. I know zoos do a lot of research and save species, but I just can't support the idea really. To me, it would seem like prison compared to being able to swing through the treetops of a jungle. They don't frequent the ground too much and this is another great travesty of wrong habitat for a wild animal. Here's some information on Orangutans from orangutan.com. Orangutans are born with an ability to reason and think. Orangutans are the only primarily arboreal great ape which makes them the largest tree-living mammal in the world. The other great apes are considered semi-terrestrial since they spend a considerable portion of time on the ground. They are graceful and agile climbing through the trees. Their food is there, their home is there and they are safer there. Almost all of the food they eat grows in the treetops and the frequent rains fill the leaves thus supplying their drinking water. When water is difficult to get, they chew leaves to make a sponge to soak up water in tree cavities. When it rains very hard the orangutan makes an umbrella for himself out of big leaves. Many people are familiar with the studies that have shown chimpanzees using tools, such as termite-fishing sticks. Recent studies show that some populations of orangutans also fashion tools to aid in the difficult task of foraging for food. 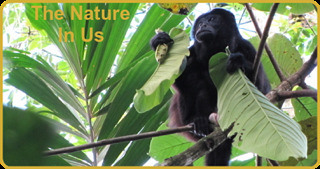 Their diet is made up of bark, leaves, flowers, a variety of insects, and most importantly, over 300 kinds of fruit. An orangutan’s lifespan is about 35-40 years in the wild. They reach puberty at about 8 years of age, but a female isn’t ready for her own baby until she’s in her teens. The orangutan has the longest childhood dependence on the mother of any animal in the world, because there is so much for a young orangutan to learn in order to survive. The babies nurse until they are about six years of age. The young males may stay close by their mothers for a few more years but the females may stay until they are into their teens, allowing them to observe mothering skills as they watch their younger sibling being raised by the mother. Orangutan females only give birth about once every 8 years – the longest time between births of any mammal on earth. (This results in only 4 to 5 babies in her lifetime.) This is why orangutan populations are very slow to recover from disturbance. The mothers must teach the babies what food to eat, where to find that food, in which trees and during which seasons. It is thought that the orangutan must have a very detailed map of the forest in her mind, and detailed knowledge of the fruiting cycles of many species of trees. (This prevents wasting valuable energy searching for fruit trees randomly, and traveling to a certain fruiting tree whose fruits will not ripen for some time). The babies must eventually know hundreds of species of plants and trees, which ones are edible, and how to process them. Tidbit - Health - There's good news on the supplement industry scene. Far too many companies out there are not putting inside the bottle what is marked on the label. There's a new research study every few weeks of companies testing various products and finding much lower potency, contamination of bugs and dirt, and they even find that not all the ingredients listed on the label are even in the bottle. Now the Dietary Supplement Programs has been elevated to an office at the U.S. Food and Drug Administration (FDA). Several industry trade associations - the American Herbal Products Association, the Consumer Healthcare Products Association, the Council for Responsible Nutrition, the Natural Products Association (NPA) and the United Natural Products Alliance - voiced their support for this move. Don't miss the details. Here's the post link. Gardening - Underground Greenhouse - Greenhouses are usually glazed structures, but are typically expensive to construct and heat throughout the winter. A much more affordable and effective alternative to glass greenhouses is the walipini (an Aymara Indian word for a "place of warmth"), also known as an underground or pit greenhouse. First developed over 20 years ago for the cold mountainous regions of South America, this method allows growers to maintain a productive garden year-round, even in the coldest of climates. Checkout this very cool idea which comes with a much lower cost than a greenhouse. Spiritual - Our character and faith is built in the darkest times of our lives, and like roses, we can release a heavenly scent to others by trusting in our Father. Instead of trying to pressure God because we think He's obligated to us, we as children gladly commit to Him our desires and trust Him. Whatever He grants will prove in the end to be the best of blessings for us. If I trust that God is for me and not against me, then I can believe that all is good in this very moment of my life. I read that a bird will never sing the melody his owner wishes while his cage is full of light. He learns a bar of this and a phrase of that, but never an entire song until .... the cage is covered and the light shut out. Many Christians and non-Christians never learn to sing until the dark shadows of life fall on them. It's doubtful that a soul can really know the love of God in all its richness, comfort and completeness until our skies are black. Light comes from darkness. Trust ... the basis of all God's love and provision for us! He will bring us forth from the Enemy's camp and use every bit of trouble that was meant for evil in our lives .... for good in us. We only need to trust. When you come to the end of yourself, your natural strength of man, then you really know that all that is good is of God and you are promised to receive it as you love Him (Romans 8:28). 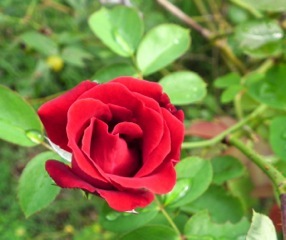 "I learned that the world's supply of rose oil comes from the Balkan Mountains. The thing that interested me most was that the roses had to be gathered during the darkest hours, with the pickers starting at 1:00 AM and finishing by 2:00 AM. Initially this practice seemed to me to be a relic of superstition or tradition, but as I investigated further, I learned that actual scientific tests had proved that a full 40% of the fragrance of the roses disappeared in the light of the day." Tidbit - Good News for Homeless in Seattle - A village of tiny houses for the homeless has been built on a plot of land owned by a church in Seattle, Washington. Volunteers did the building work and have completed 14 homes with oil heat and electricity and a lock on the door. All extravagances for a typical homeless person. There's a central location with running water, restrooms and showers. The cost of each home is about $2200. Watch the video. Our Christian Heritage - Freedoms guaranteed in the Constitution of the United States, the Bill of Rights, and other documents on which this country was founded are being systematically overturned. Christians have largely remained silent. Dr. Martin Luther King Jr. is accredited with saying, “The greatest tragedy of this period of social transition was not the strident clamor of the bad people, but the appalling silence of the good people.” While his statement was made regarding the civil rights issues of his day, it still applies to the problems facing the American public today. Christians can turn the tide to make laws that line up with God's laws. We have no right to sit back and simply complain about what's happening if we aren't willing to exercise our wisely chosen vote to make a difference. Being "politically correct" is not an option for Christians who are to base their lives and decisions on what the Word of God teaches. The world calls this "intolerance" or "hatred" but it's love. In the case of the recent homosexual marriage laws, it's not hatred to come against that law. Homosexuality has some cruel statistics of abuse and early death from diseases. “It’s love to tell a person if the bridge is out and they’re going to die if they go that way." There is a choice and there are support groups. May You Be Blessed With Boldness in Your Christianity!